Chile loves American products. Last week, at a Trade Mission reception in Santiago, Chile, I enjoyed skewer hors d’oeuvres of fresh California strawberries and Hawaiian pineapple. Add a few other U.S. imports, such as the Apple Store and KFC, and you will see that American brands abound. For decades, Chile has offered an economically stable and receptive market for U.S. brands. If you stroll through a shopping district or visit any mall, you will see diverse logos of American services and products. Read more the opportunity for U.S. concepts in Chile from this International Franchise Association article. Colombia is often overlooked as an opportunity for U.S. exports. Having attended the U.S. Franchise Trade Mission to Latin America last week, I can attest to the fact that Colombia is open for U.S. business. If Colombia is not on your list of export target markets, think twice! 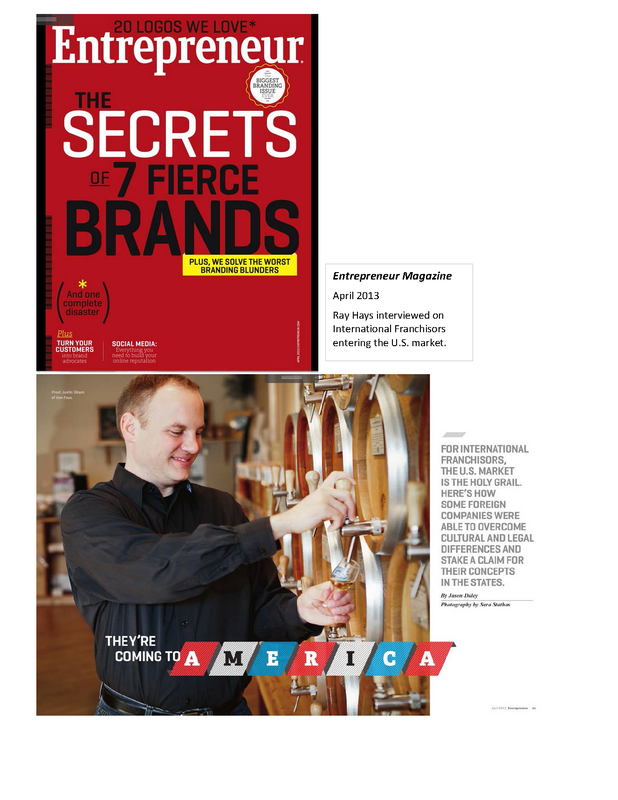 This article from the International Franchise Association provides good insight into the opportunity for U.S. brands. Along with dozens of other U.S. franchise concepts, I joined this Trade Mission to promote U.S. franchises to Latin American investors. Panama was our first stop. The market is booming, and U.S. franchisors found high levels of interest in introducing new American franchise concepts. Our international franchise management company, EGS, represented a range of franchisors, including Sport Clips® Haircuts for Men, BrightStar Care®, Rita’s Italian Ice®, Fuddruckers®, Round Table® Pizza, and The Melting Pot®. Click here for the full Article from the International Franchise Association blog. The U.S. Commercial Service in collaboration with Franchising Group EGS is promoting 5 established U.S. 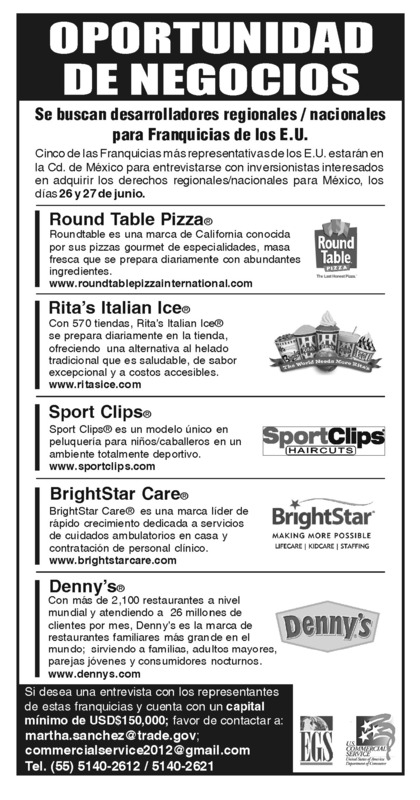 Franchise Concepts, who are seeking Area Franchisees and Master Franchisees in Mexico. Investment requirements start at US$150,000. Meetings with candidates will be held Tuesday, June 26 and Wednesday, June 27. For more information, click on the Summary links below to view more details on the franchise concepts, candidate requirements and financial metrics. Contact at U.S. Trade Office in Mexico City: Martha Sanchez, martha.sanchez@trade.gov, Tel: (55) 5140-2612 / 5140-2621. If you are in the Clean Energy sector, you should be aware of this event. Reblogged courtesy of Ray Hays, Member of Arizona District Export Council. In April, Assistant Secretary Nicole Lamb-Hale will lead a Clean Energy and Energy Efficiency Trade Mission to Saudi Arabia. The mission will include market briefings by industry experts, opportunities for U.S. firms to meet key Saudi Arabian government officials and decision-makers, hold one-on-one meetings with potential business partners, and enjoy networking events, with the goal of increasing U.S. exports in the clean energy and energy efficiency sectors. The mission comes at a critical time for both Saudi Arabia and the U.S. clean energy and energy efficiency industry, and has the potential to create opportunities for U.S. exporters while helping Saudi Arabia to achieve its energy goals. INTERNATIONAL FRANCHISING… Taking your brand global. Is your franchise concept ready to go international? What are the pitfalls of launching your international franchise program? What are the resources and budget requirements to launch a global franchise expansion program? Join Ray Hays, as he discusses these questions and more with Franchise Today radio hosts Paul Segreto and Joe Caruso. Click here to listen to interview taped October 13, 2011.